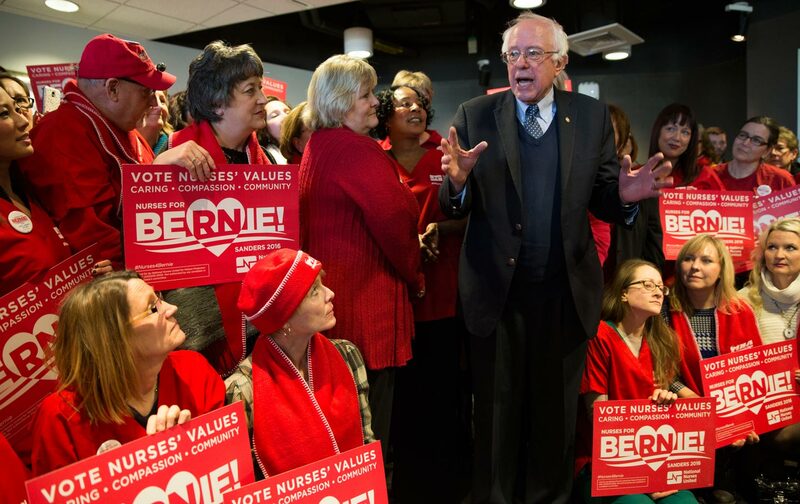 For nurses, everything begins with a basic dedication to their patients, which is why so many of them are supporting Bernie Sanders for president. With the 2016 election, we have a rare opportunity to break the chokehold the neoliberal agenda has maintained for nearly half a century on the political, economic, and social life of this nation. To do so, we will have to get over the crushing cynicism that has defined establishment politics for decades and elect Bernie Sanders as president. For too many liberals, the far-right obstructionists in Congress and state governments have served as an excuse for resignation and lowered expectations. But not everything can be blamed on the right. In his important new book, Listen, Liberal, Thomas Frank aptly describes how the Democratic Party steadily shifted away from its traditional working-class base and became a champion of Wall Street and Silicon Valley technocrats. It’s an inconvenient truth that many of the policies that produced decades of wage stagnation, massively transferred wealth to the 1 percent, and created the “you’re on your own” society started not with Ronald Reagan but with his predecessor, Jimmy Carter, a Democrat. As Frank notes, it took the presidency of Bill Clinton to bring this new world order to full fruition. From the shredding of manufacturing jobs with NAFTA to the 1994 crime bill, from the gutting of welfare that left millions in extreme poverty to deregulating the banking, electricity, and telecom industries—Clinton cemented the Democratic Party’s alignment with Wall Street and global capital. As a result, millions of American workers and families continue to struggle in an economy tilted to the wealthy and the elite and a political system corrupted by corporate donors and billionaires. Hillary Clinton attacks the premise of single-payer and insists we can’t “refight” healthcare. Instead, she merely promises to tweak the gaping holes in the Affordable Care Act. Rather than banning fracking, as Sanders favors, she proposes “safeguards” that rely on companies to disclose the deadly chemicals they use. But these measures would do little to reduce the carbon emissions that jeopardize public health and cause climate change. In the area of experience she touts most, foreign policy, her fondness for regime change—as evidenced in Libya (which President Obama now calls his “worst mistake”), her implicit support of a disastrous coup in Honduras, and her embrace of Henry Kissinger—hardly offer comfort. Fortunately, we have an alternative. Bernie Sanders’s campaign—and the movement aligned with it—is the most significant effort to uproot the Democratic Party establishment in decades (with a nod to the Rev. Jesse Jackson who, like Sanders, was demonized by both the corporate media and party elites). National Nurses United is proud to have been the first national organization, and first national union, to endorse Sanders. Our members have traveled across the country to talk to the ordinary Americans left behind by the “recovery” and persuade them that only Sanders’s candidacy represents a fundamental break with the status quo. Why? Because Sanders is campaigning on many of the issues that have animated nurses for years. He proposes Medicare for All and aggressive action to move away from a fossil-fuel economy that causes climate change and its harmful health impacts. He pledges to reverse the grotesque income inequality that keeps far too many trapped in a cycle of poverty, inadequate housing, food insecurity, and low-paying jobs. For nurses, everything begins with a basic dedication to their patients. Everyone is entitled to quality care, no matter their ability to pay, gender, race, age, sexual orientation, where they live, or where they were born. As the organized voice of nurses, NNU extends this humanitarian imperative to the public arena—starting with healthcare. While the Affordable Care Act did interrupt some of the most egregious insurance abuses, you are still not “insured” if you have to forgo chemotherapy or seeing a specialist because of high out-of-pocket costs. You’re still not “insured” if you have to make that painful choice between getting the care you need or paying your rent. One-fifth of people with insurance have difficulty paying their medical bills, The New York Times reported in January. Of those, two-thirds said they had used up most or all of their savings. Is it truly “pie in the sky,” as Hillary Clinton claims, to continue to fight for guaranteed healthcare for all, as is the standard in most of the rest of the world? We don’t believe so, which is why we join with Bernie Sanders in insisting that health care is a fundamental right. Advocate for free tuition at public colleges and universities so everyone has the opportunity for higher education. Oppose the Trans-Pacific Partnership pact, which will outsource more American jobs and protect pharmaceutical profits with inflated prescription drug prices. Champion a tax on Wall Street speculation that would raise $300 billion a year to pay for the college plan, as well as healthcare, affordable housing, job creation, climate action, and other basic needs. Propose concrete, comprehensive plans for meaningful criminal-justice and immigration reform, not just based on rhetoric but buttressed by a lifetime record of fighting for justice for all. Take time on the campaign trail to join picketing workers, as Sanders has throughout a career that has produced the most pro-union record of any leading Democratic candidate for president. Call for a “political revolution,” because that is how real change has ever occurred in the United States, from abolition of slavery to women’s suffrage, from union rights to ending Jim Crow segregation to marriage equality. Many progressives intrinsically know that Bernie Sanders is the best choice for achieving the fundamental change we so desperately need. But they get mired in the ocean of ink from corporate media that writer-educator Robert McChesney calls Hillary Clinton’s “true firewall”—the sole purpose of which is to derail a campaign and movement that represents a threat to their class interests. Don’t be misled, discouraged, or demobilized. The race can still be won. Many states with hundreds of pledged delegates have yet to vote, and superdelegates can as late as the convention change their support to the candidate they think will win in November. There are lots of reasons why that candidate is Sanders. A year ago, he trailed Clinton by 60 to 70 points. Now, he has tied her in many national polls, despite her advantages of name recognition, a deep war chest filled by non-stop fundraisers, the backing of the Democratic Party machinery, and the endless fawning of the mainstream media. Despite all that, Bernie has now won seven of the last eight primaries or caucuses by double digits, and his momentum heralds future wins. While Clinton struggles with the highest unfavorable ratings of any candidate in recent memory not named Trump or Cruz, Sanders has among the best ratings for honesty and trust. From his years of being re-elected over and over in Vermont, to his growing national support, Sanders has shown a rare ability to attract Reagan Democrats and independent voters, as well as sparking the enthusiasm of young voters. Nearly all of those who have voted for Clinton would likely support Sanders in November. By contrast, there is real doubt that the base now voting for Sanders would carry over to Clinton, since many of them do not trust her. It is for these reasons, as well as the widespread disgust with a corrupt political and economic system, that Sanders fares better in virtually every comparison poll with the three remaining Republicans than does Clinton. Those who worry that Sanders will be red-baited in a general election forget that the Clinton campaign and their surrogates have already played that card, and that it hasn’t worked against someone who has long described himself as a democratic socialist. Who is the more electable candidate? The guy who is rising in the polls. Millions of Americans, including some who have never voted, are excited for the first time. Millions of Americans who haven’t voted for a Democrat in years have been moved by the promise of Bernie Sanders’s campaign. They are counting on all of us to get there with them. There’s no time to lose.